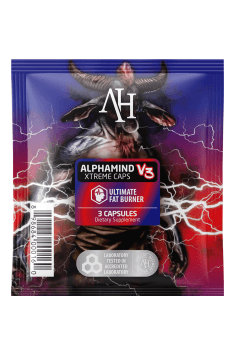 Apollo’s Hegemony Alphamind V3 Xtreme Caps is an evolved form of one of the most effective formulas supporting fat burning ever created. The new version offers an enriched composition of the most assimilable forms of components that support stubborn fat burning in a multifaceted way as well as enhance intellectual and mental capacity of the organism. The most conspicuous components are acetylated forms of carnitine and tyrosine, whose uniqueness consists in their ability to cross the blood-brain barrier easily unlike their regular forms, which greatly improves cognitive abilities and the mood. It is particularly important in the case of greater mental struggle connected with the reduction diet. The combination of those substances also directly affects reduction itself. The right amount of carnitine is crucial for the optimal speed of fatty acid beta-oxidation, while tyrosine is a precursor of adrenaline, which stimulates lipolysis in adipose cells. However, those are not the only substances that have a positive effect on the nervous system. The use of Alpha GPC, the most efficient form of choline, increases the pool of acetylcholine available, that is one of the most important neurotransmitters in the organism that takes part mainly in proper muscle activation. Additionally, it can stimulate lipolysis. Inositol is of great help when it comes to improving the mood. It is also an important mediator of signalling molecules in glucose metabolism, so its supplementation will let you achieve a greater degree of its absorption and right use. The combination of Bacopa monnieri and Gotu kola – a combination of one of the most potent substances when it comes to procognitive and adaptogenic properties – has a great effect on stimulating neurogenesis, the speed of communication between neurons, and general mood improvement. Another interesting combination of products are L-theanine and caffeine anhydrous. They directly stimulate and increase alertness and concentration by working in synergy. What is more, theanine often eliminates the negative side effects of using caffeine, such as shivering of the body, distraction, anxiety, or the effect of sudden energy drop when caffeine stops working. Olive oil extract contains a large amount of phenolic compounds, including oleuropein, a compound associated with the long lifespan of olive trees. It directly helps to support fat reduction by intensifying adrenaline and thyroid hormone secretion. It also has a positive effect on glucose metabolism. Rauwolscine is a another component that helps to maintain higher levels of fat burning. Its antagonist activity to alpha-2-adrenergic receptors results in elevated levels of cAMP, the basic signalling molecule that participates in energy processes, including lipolysis. Moreover, the formula also contains a metabolically active form of vitamin B12 – methylcobalamin, which is responsible for maintaining the homeostasis of the nervous system, L-leucin, which eliminates muscle mass losses that often accompany reduction diet, and piperine, which ensures the highest bioavailability of all the active components. To sum up, Apollo’s Hegemony Alphamind V3 Xtreme Caps is a formula that will meet the expectations of every gym fan. It definitely stands out thanks to its ability to support the nervous system in a complex way, and the condition of the system is often not perfect because of the stress that accompanies reduction diets. It also focuses on more than just basic stimulation and metabolism boost. It contains only effective components in carefully adjusted and efficient doses. The recommended dosage is 3 capsules daily. On training days, a portion should be taken 30 minutes before workout, while on other days, it should be taken in the morning or before an anticipated intellectual effort. When you are oversensitive to stimulants, the initial dosage should be 1 capsule daily. It is not recommended to take the serving shortly before bedtime because it may cause discomfort during sleep or make it difficult to fall asleep. When you use the product for intellectual performance, it is recommended to take it with a small portion of a fat-based meal.